Bruce Ismay: Coward, Villain, or A Man Who was Judged Unfairly? On October 17th, 1937, Joseph Bruce Ismay had a stroke and died at the age of 74. Ismay had been living in a house in Wirral, which is close to Liverpool. He had only been in living in England for about three months after having lived for over a decade in Ireland. After living in Ireland since the 1920s, Ismay’s health began to decline after he had been diagnosed with diabetes. By 1936, Ismay’s diabetes was getting worse and caused the loss of his right leg. Ismay’s funeral was held four days later on October 21, 1938. He was survived by his wife, Julia Florence Schieffelin. Joseph Bruce Ismay had been the director of the White Star Line at the time that the RMS Titanic went down, and the result of the disaster left Ismay with a besmirched reputation, but did he truly deserve to be judged as a coward and fiend, or was he just a man that saw the chance to save his own life and took it? Joseph Bruce Ismay came into the world on December 12, 1862, in Crosby, Lancashire. Ismay’s parents were Thomas Henry and Margaret Bruce. 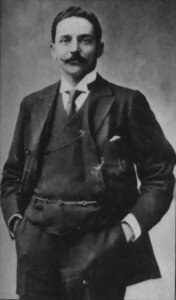 Thomas Ismay founded the White Star Line, and after his death, his son Joseph Bruce took over as chairman. Growing up, Ismay enjoyed the finer things in life as the eldest son and received his education at the Elstree School and Harrow School. Once out of school, in 1891, Ismay joined his father’s business, Ismay, Imrie, and Company, and was able to see the world during that time. He even got to travel to New York City as a company representative. When his father died in 1899, Ismay inherited Ismay, Irmie, and Company and showed that he truly had a talent for business. Two years later in 1901, Ismay merged his company with J.P. Morgan’s company, International Mercantile Marine. Once Ismay took over the White Star Line, his first order of business was to add more to the fleet of White Star Line ships. Under his father Thomas, White Star Line had only built one ship, which was the RMS Oceanic, but Ismay had an idea to build four more ships, and they were officially called the Big Four. The names of the Big Four were the RMS Celtic, RMS Cedric, RMS Baltic, and the RMS Adriatic, as it was tradition that the company’s ships all ended in “ic.” Unlike other shipping companies, Ismay wanted the Big Four to be luxurious, but also fast at the same time. By 1904, Ismay was the president of the International Mercantile Marine and had the full support of J.P. Morgan. 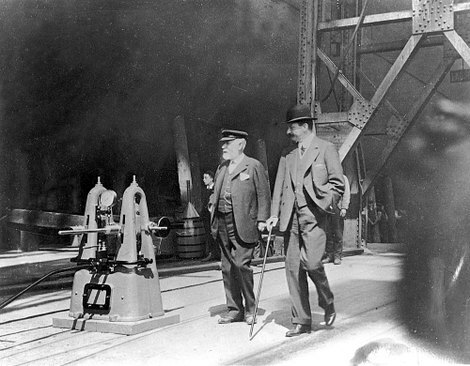 In 1907, Ismay had a meeting with Lord William James Pirrie, who was chairman of the Harland and Wolff shipyard. The two men were meeting up to discuss the fact that Cunard Line had come out with two ships, the RMS Lusitania and the RMS Mauretania, which had the reputation of crossing the ocean in record time. Together, the two men envisioned three ships that would be faster and more superior than the Cunard ships. These three ships would be named the RMS Olympic, RMS Titanic, and RMS Gigantic, (which would later be renamed Britannic.) Ismay did not want to build ships that would be faster than Lusitania and Mauretania, but would be the fanciest ships in the world that offered passengers luxury beyond compare as they sailed from England to New York. Ismay knew that the richest people in the world would want to cross the Atlantic in the best accommodations possible, and the Titanic was soon booked with the richest people in the world. On April 10th, 1912, Titanic set sail from Southampton, and Ismay was among the passengers. The officers and Captain Edward Smith were well aware of the fact that the man who essentially owned the Titanic was among the passengers. There is a controversy over whether or not Ismay influenced Smith to push the speed of the Titanic in order to arrive in New York on Tuesday night, which was faster than Olympic on her maiden voyage. 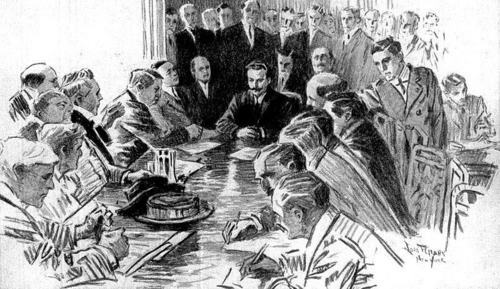 Though Ismay denied that he tried to make Titanic go faster, there were several witnesses that testified at the Titanic Inquiries who had heard Ismay’s conversation with Captain Smith about getting to New York earlier than expected. When Titanic collided with an iceberg, Ismay appeared on the bridge and wanted to know what was going on, as well as when the voyage could continue. When Andrews broke the news that Titanic was going to sink, the realization that his unsinkable ship had only two to two-and-a- half hours left made Ismay grow pale because he realized that at least half the passengers on the ship were going to die. While the ship was sinking, Ismay did try and help as much as he could, even helping the officers and seaman to fill the boats and then lower them into the water. When one of the last lifeboats was put into the water, Ismay stepped into it, but he does maintain that when he did, there were no women and children in sight. As the Titanic went down, Ismay turned away and claimed that he never saw her go down. When Ismay was on the Carpathia, he was distraught and spent the voyage inside the ship doctor’s cabin, drugged. Ismay did send a telegram that instructed another ship to be prepared to take him and the surviving officers back to England. However, once Carpathia got to New York, Ismay and his officers were not allowed to leave because they were under subpoena for an inquiry lead by Senator William Alden Smith. After both the American and British Titanic inquiries were over, Ismay had no choice but to leave America, and even though he was exonerated, his reputation was never the same. By 1913, Ismay was still feeling the effects of being called a coward and “J. Brute Ismay” and resigned as White Star Line chairman and President of International Mercantile Marine. Joseph Bruce Ismay was on top of the world when Titanic was declared to the beautiful and most luxurious ship that was ever created. However, Ismay went from the top of the mountain to the bottom of the hill when Titanic sank and he was among the survivors. During that time frame, it was women and children first, but can Ismay truly be blamed for wanting to live? 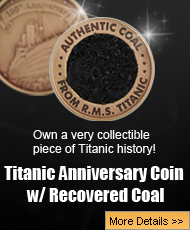 It was not Ismay’s fault that the Titanic struck an iceberg and began to sink, yet he shouldered a lot of blame for the deaths of over 1,500 people and paid for it with his own social standing and reputation. Whether he was a villain or not, Ismay was an ambitious businessman that wanted to bring class and luxury into the maritime world, but fate had other plans for both him and his beautiful ship.